These Cosco 2000 plus date stamps are versatile, lightweight and an economical option for occasional dating needs. 2000 plus daters with it's sleek look and smooth stamping action. 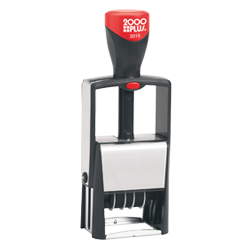 The self-inking 2000 plus date stamp is a fit for every purpose: in the office, at home or even on the go. With Microban Technology. Microban protection begins to work as soon as the microorganism comes into contact with the product surface. It then works continuously to maintain a consistently lower bio-burder than would be expected on a product without Microban antimicrobial protection. Under the right conditions, microbes on an untreated surface can double every 20 minutes! Microban technology is not a disinfectant and is not a substitute for normal cleaning practices. Available with 6 year bands and with just the numbering bands without the dates!